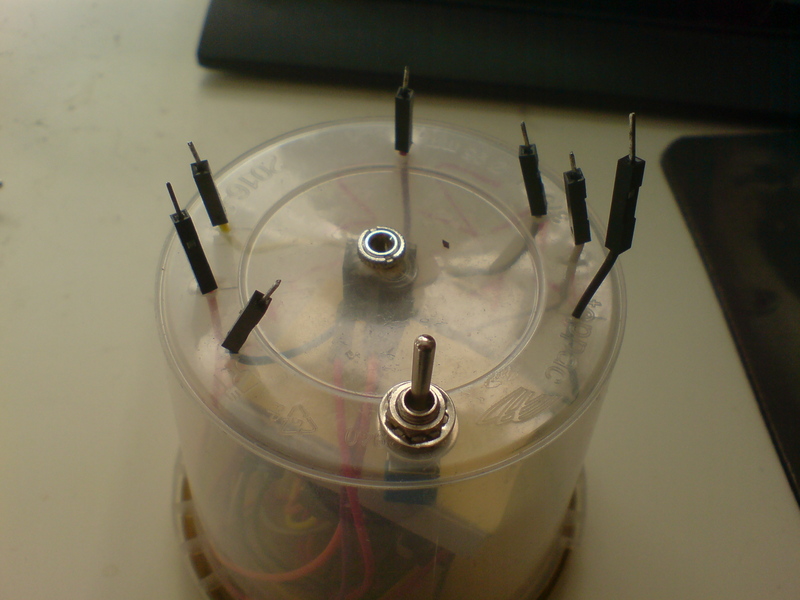 To make the KVS Oscillator aka Kazz Noizer. 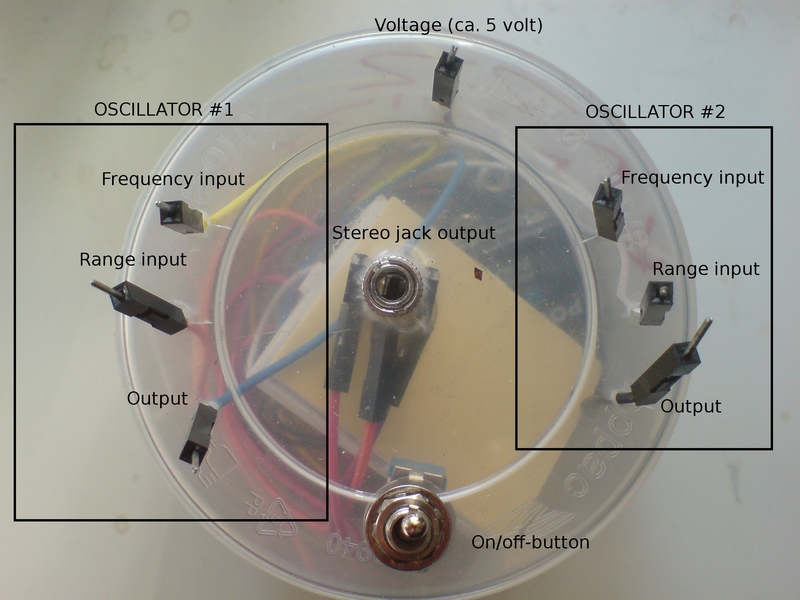 Step 1: Making the circuit KVS Oscillator aka Kazz Noizer is a simple voltage-controlled oscillator (or wave generator) which can create audio and/or visuals by adding resistance to the low-voltage circuit. The KVS Oscillator aka Kazz Noizer is an easy application of the SN74LS629N. The LS629 contains two oscillators running on the same power source but with seperate input for frequency and range control. 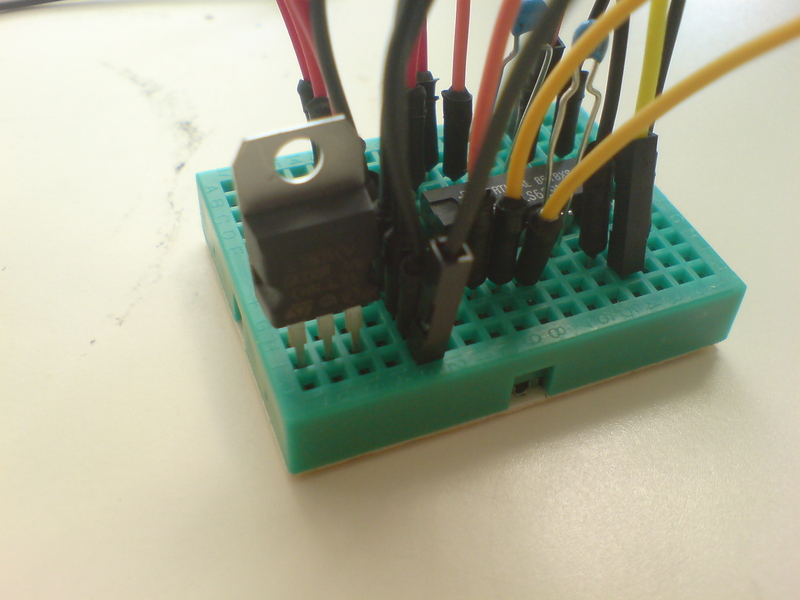 If you look in the datasheet you can see the different functions of each pin. 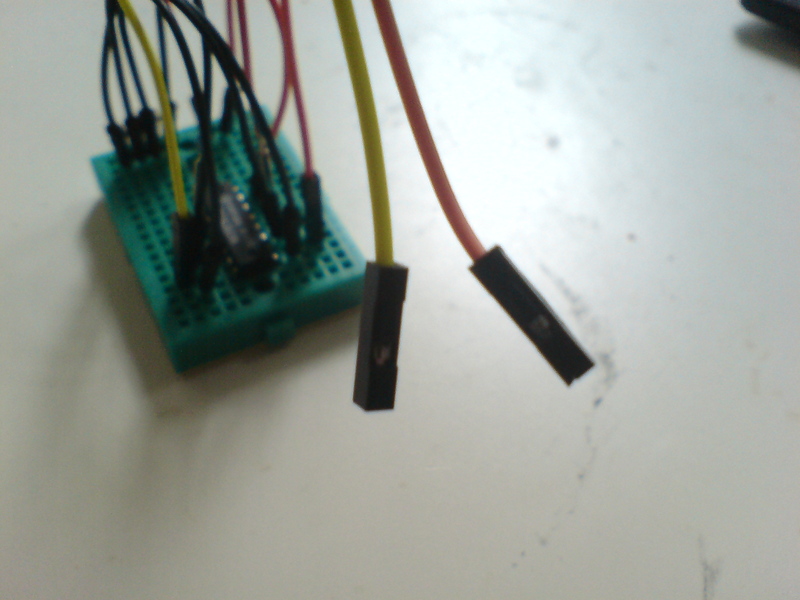 First, we will connect the power and ground pins. 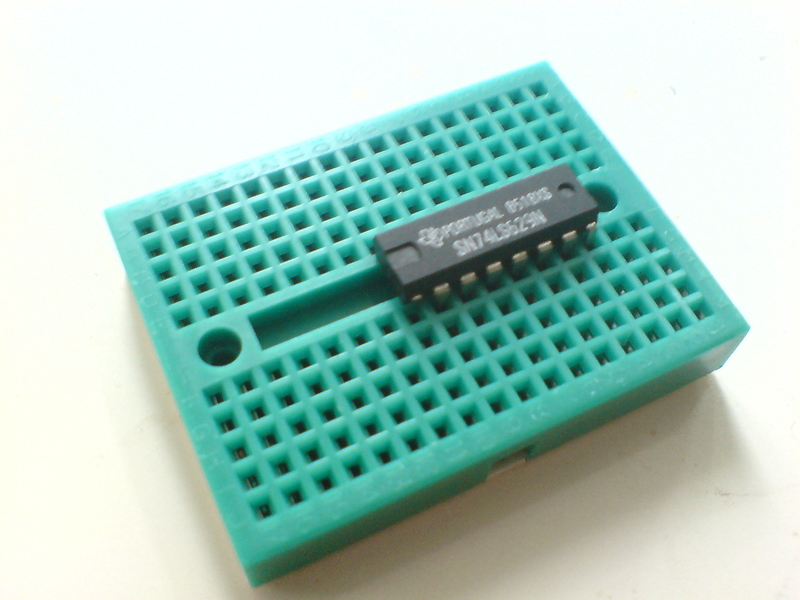 Pin 15 and 16 provides power for the oscillators and the chip itself, respectively, and pins 8 and 9 are ground for oscillator and chip. 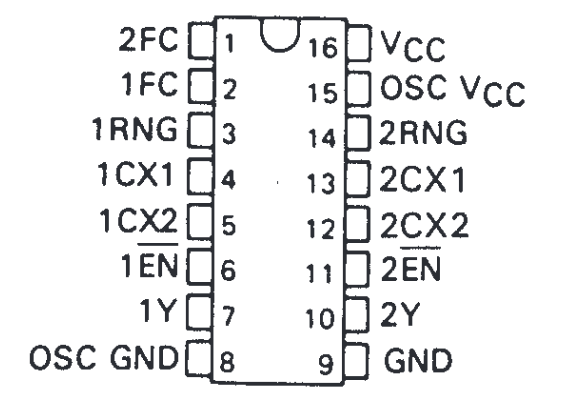 Furthermore, the two "en" pins (pins 6 and 11) need to be grounded. 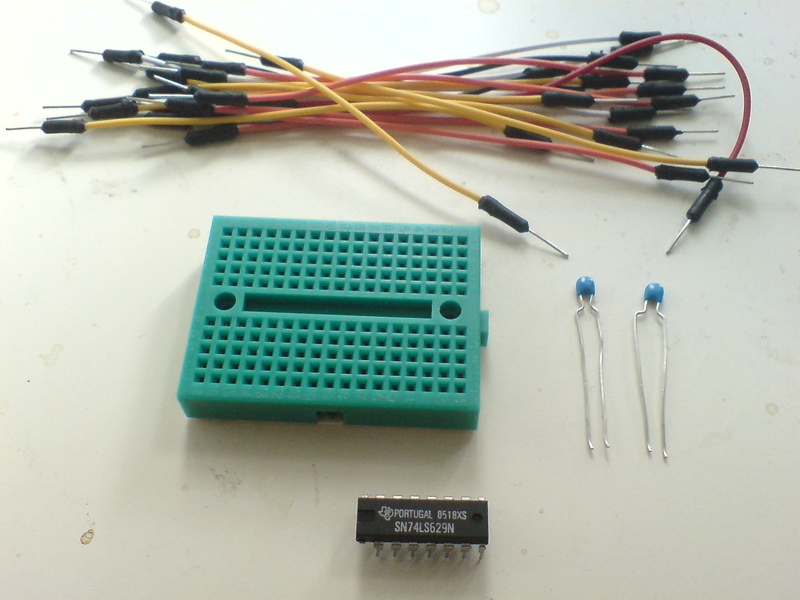 Next, we add the 100 nf capacitors that makes the oscillation. These should be added between the two CX pins for each oscillator, ie. one between pins 12 and 13, and the other between pins 4 and 5. 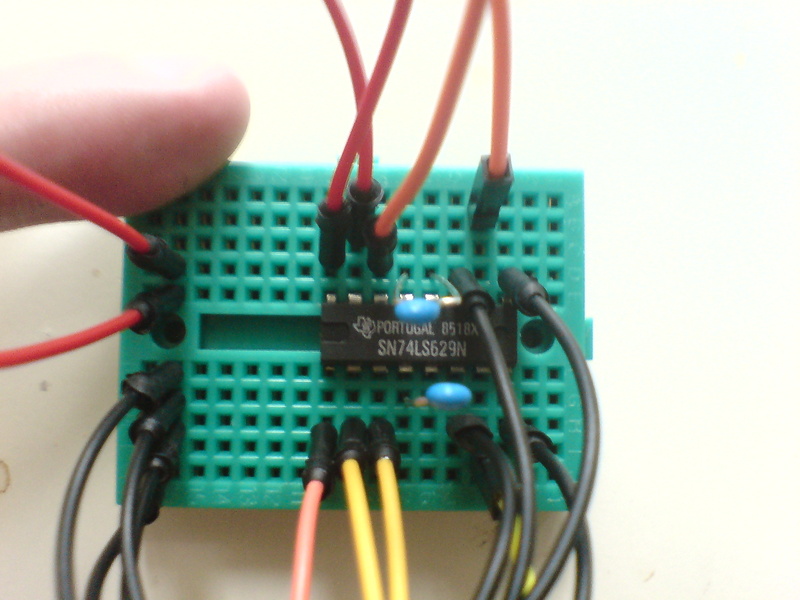 Then we put one male-to-female wire to each of the output pins (pin 7 for oscillator #1 and pin 10 for oscillator #2). We'll connect the two female ends to the jack socket in a second. I've chosen a yellow wire for oscillator #1 and an orange wire for oscillator #2 to keep track of the oscillators, but this is not essential. In the same way, we can connect the frequency and range inputs on pins 2 and 3 (for oscillator #1) and pins 1 and 14 (for oscillator #2) with male-to-male wires. The ends do not need to be connected to anything at this point. Also add one male-to-male wire to the row of power wires. 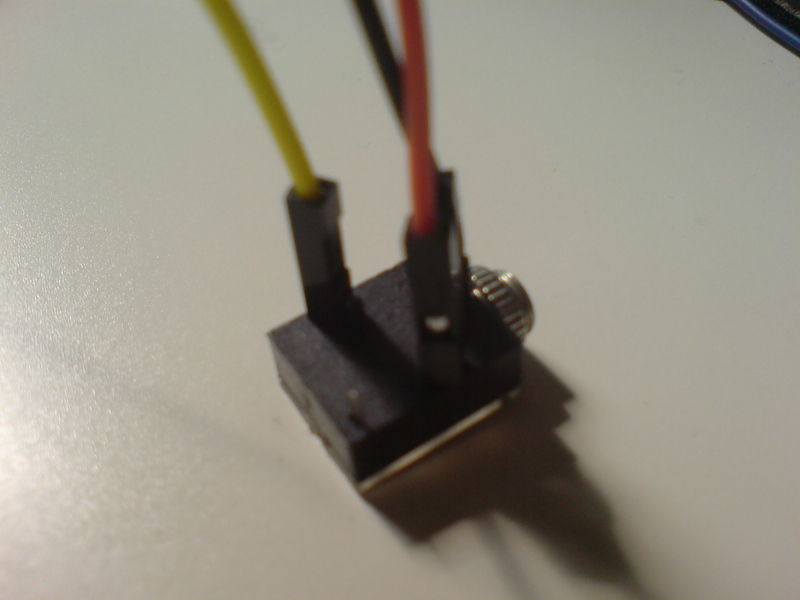 Finally, we connect the wires from the output pins, as well as one wire from ground to the jack socket. 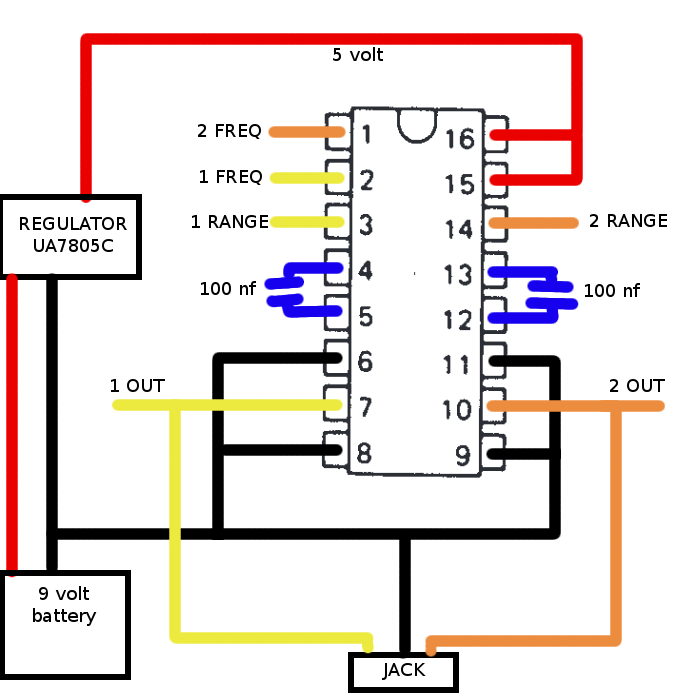 Connect the power and ground rows to your 5 volt power source and a set of stereo speakers to the jack socket (start at low volume!! ), and you should hear a high-pitch noise in each speaker. 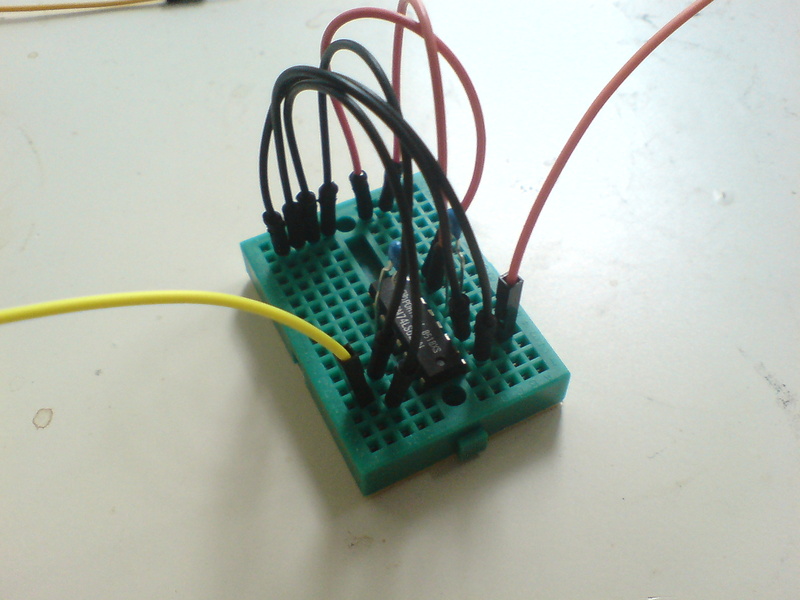 If the circuit is working, you can use a wire with alligator clips to connect the power wire on either of the four loose ends that control the oscillators, and you should hear the pitch modulate. 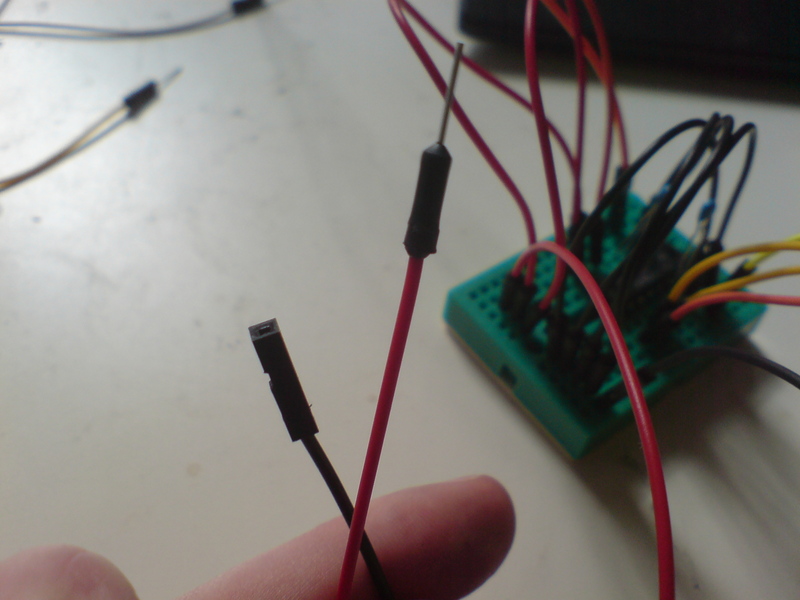 If you provide resistance between the power and the input wire (e.g. 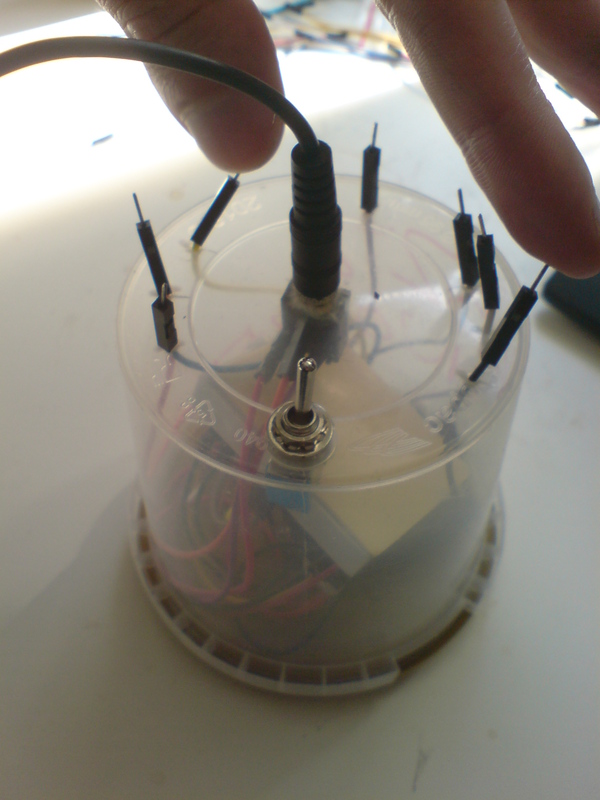 by touching one wire with each hand, so that the current runs through your body and reacts to it's resistance) the pitch changes. Step 2: Connecting with Kasper Video System Connecting this circuit to the Kasper Video System is easy. 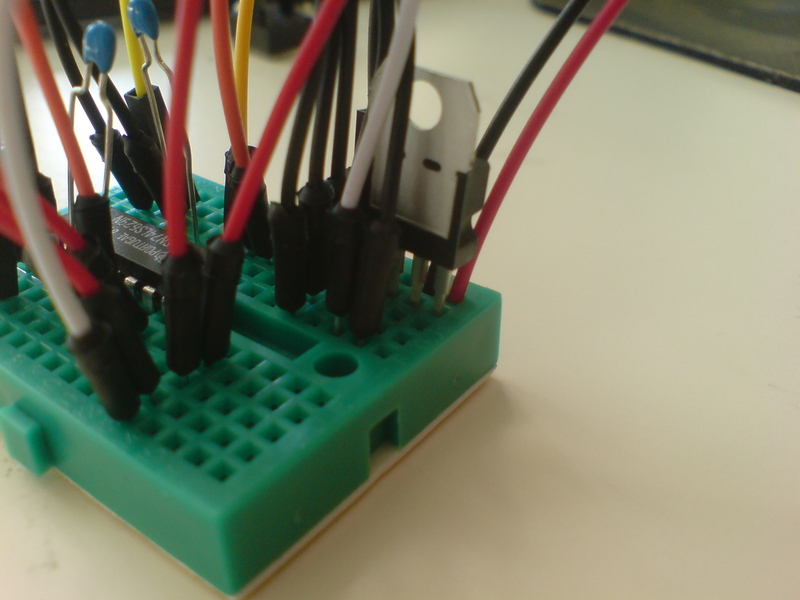 Instead of (or along side) connecting the output pins to the jack socket, you can connect the output into one or more color pins on the KVS Splicer and see the result. 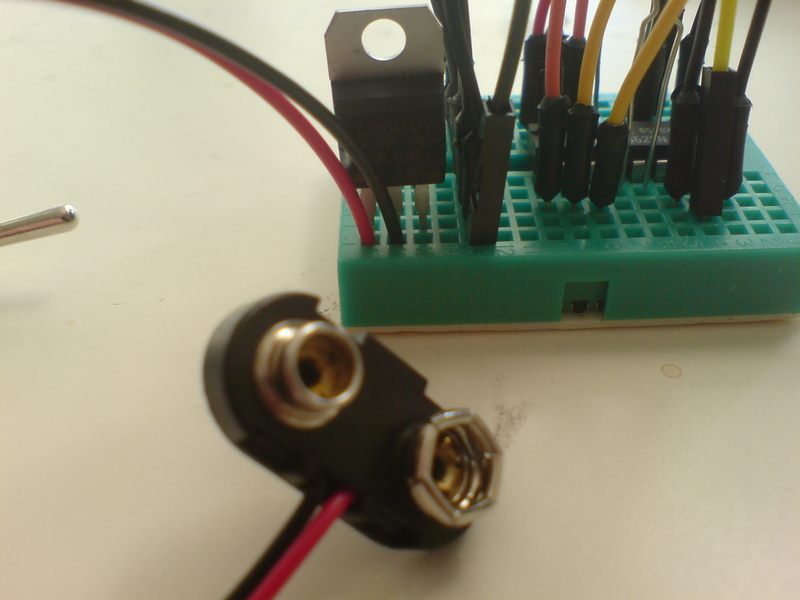 Just connect the h sync, v sync and ground to the output of a KVS splitter, and connect the KVS Oscillator. As you modulate the frequency of the wave, the screen will produce horizontal lines scrolling at different speed, with variable spacing and size. Step 3: Making it portable (optional) Especially if you plan on using the noizer, I recommend that you make it portable by making a battery-driven power supply. 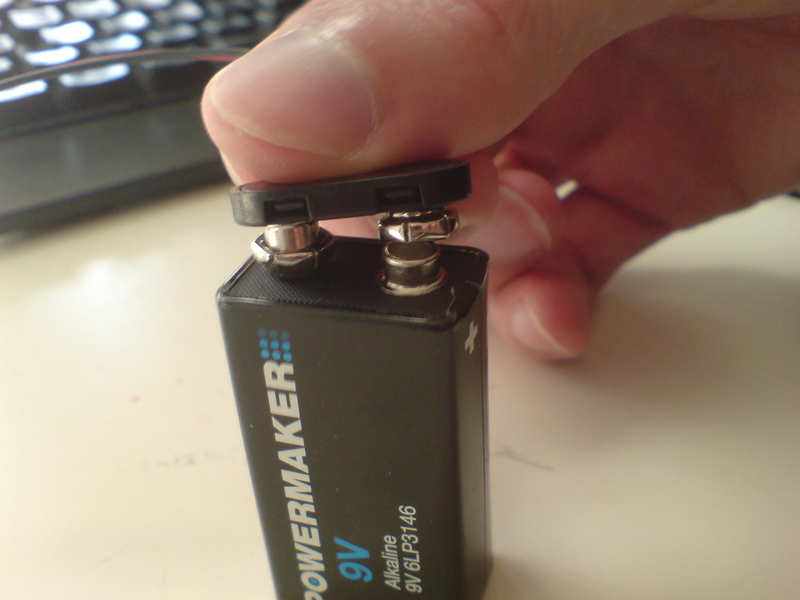 This is easily done with a positive voltage regulator (5 volt), a battery clips, a 9 volt battery and (optionally) a on-off button. 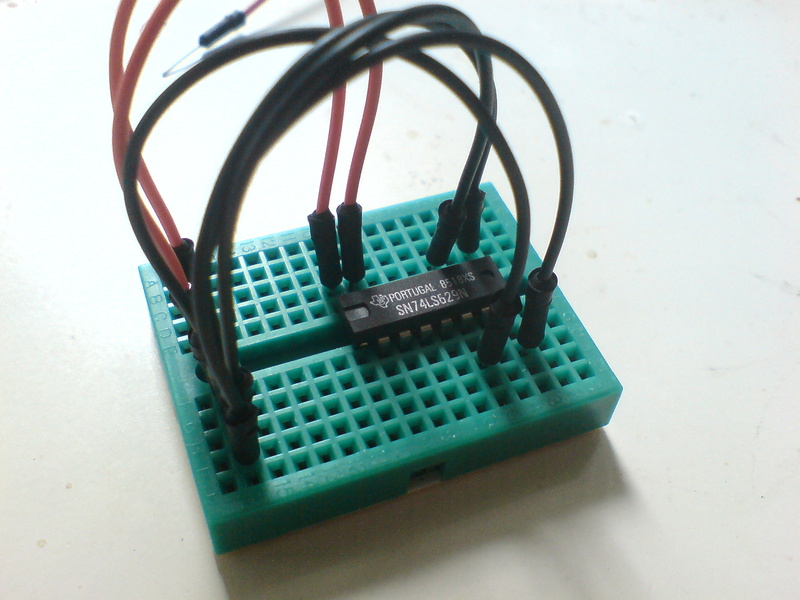 The positive voltage regulator is needed to transform the 9 volt battery to 5 volt suitable for the chip. 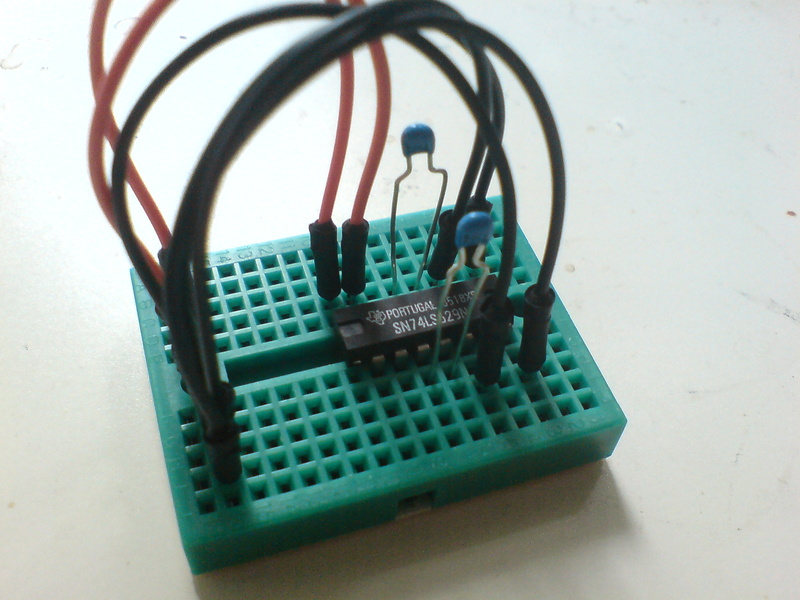 Attach the regulator on your breadboard with the metal site away from you. Now, the middle pin is for the ground wire from the battery clip and the pin on your left is for the power wire of the battery clip. 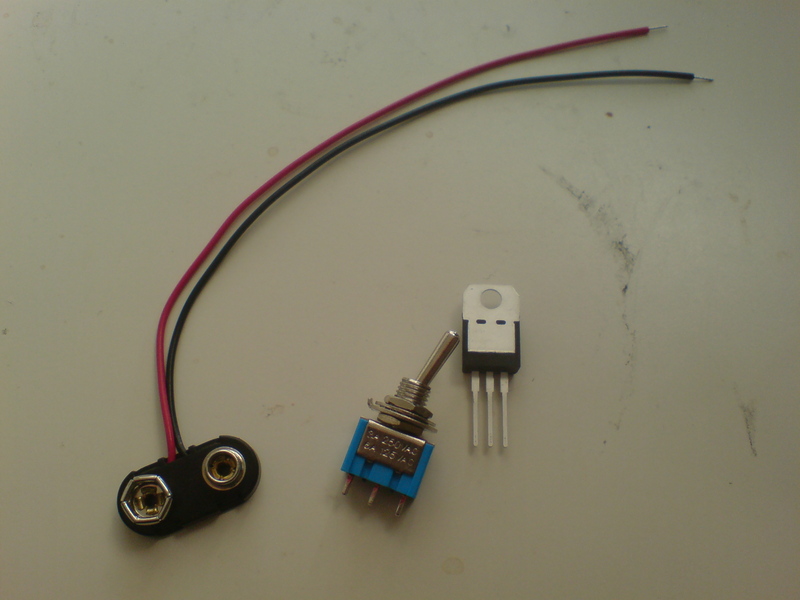 To use the voltage from the regulator, you attach the power connection to the right pin of the regulator, which provides the 5 volt power source. For ground just use the middle pin. Attach the battery to the clips and hear if it works. Whenever the battery is in the clip, the chip is running - even if your jack socket is not connected to a speaker. This means that you should always remember to remove the battery when the device is not in use, in order to save power. Alternatively, you can add a on/off button on the power wire from the battery clip, ie. 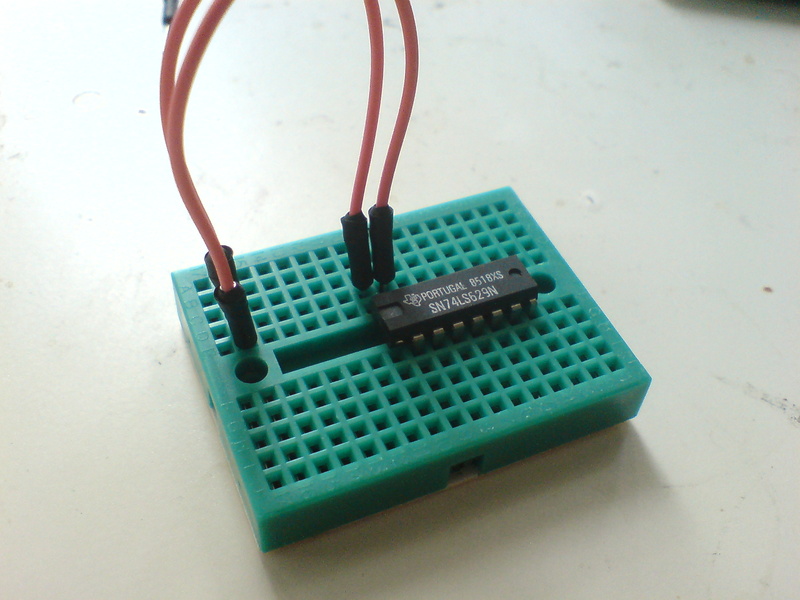 before it reaches the voltage regulator. This way you can turn the device on and off without removing the battery. 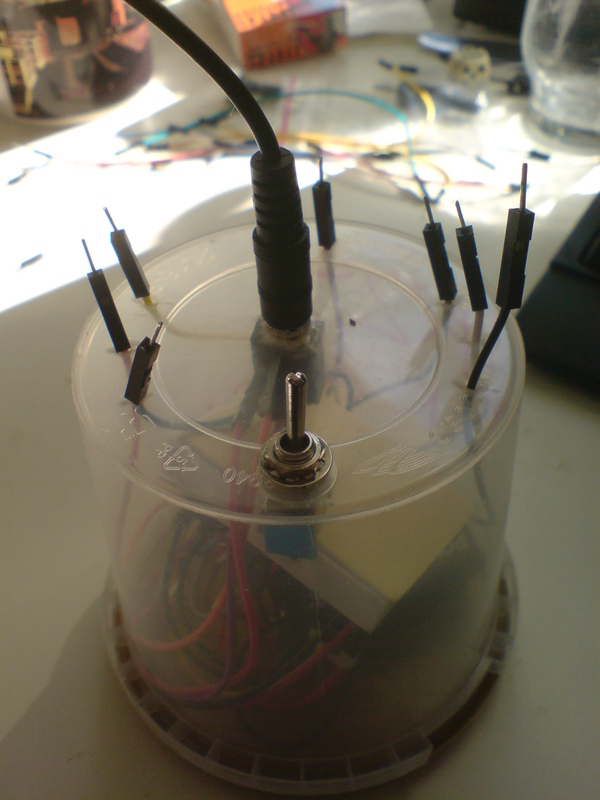 Finally, you can find a box, make holes in it and mount the wires, sockets and button to it. 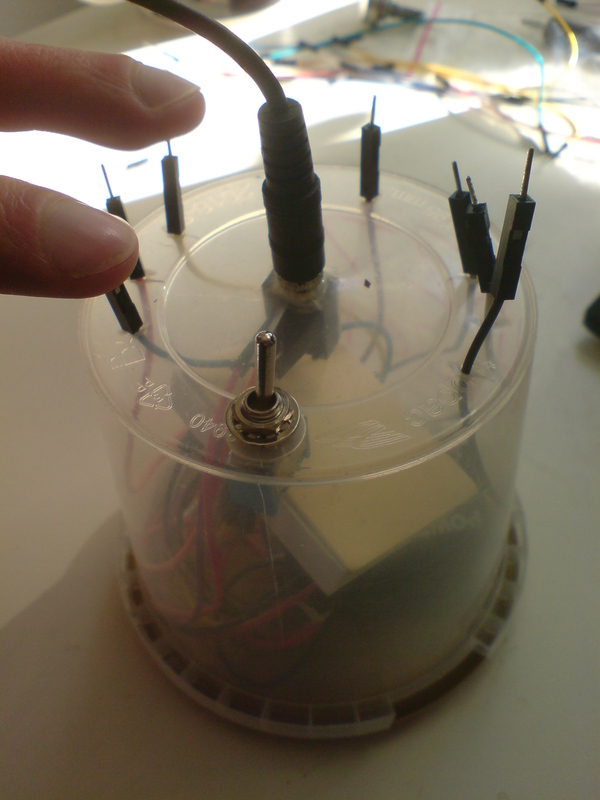 I've made one using a plastic jar where I've made a hole for the jack socket in the middle. Then I've made three small holes on each side for the frequency and range input for each oscillator as well as one for the output. With the outputs, you can connect the output of the oscillator to one of it's own inputs and make feedback, or even connect both outputs of each oscillator to the input of the other to make even more complex feedback patterns. In the middle I've made a small hole for the jumper wire that brings power (directly from the regulator output) and the on/off button on the other site. Congratulations Now go out and make noise and lines! !